You are here: Home / All blog posts / Hi, remember me? Remember me? Â Last seen throwing up hands in despair and turning to work on the lining? Applique fabric too “busy”. 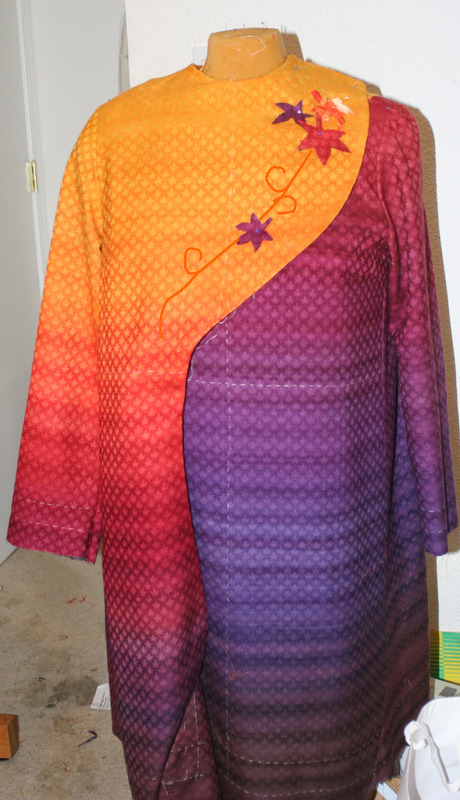 Â I was using the same fabric as the body of the garment, for convenience, but it really needs to be a bit plainer, or at least different from the body fabric. Â It just looks funny. Applique fabric Â too heavy. Â Leaves are light and airy. Too many leaves – they compete with the curve and add heaviness to the design. I’m still playing around and percolating – this weekend I plan to dye bits of many different fabrics (chiffon, organza, china silk, charmeuse) and layer, paint, silkscreen, etc. the bits until I arrive at a format I like. Â I may also play around a bit with polymer clay, though that is a bit less likely. I have also been hard at work on the lining. Â I have thread-traced nearly all the pattern pieces, and am preparing to baste and sew. Â My goal is to get the lining mostly in before going up to see Sharon on Saturday afternoon. Â That is a tall order, but as I’m taking this afternoon off work, that should give me time to get a good stab at it. The house offer fell through; Â the bank had eight offers and invited us to give our “highest and best” offer (i.e. more money). Â We weren’t willing to increase our offer and felt it was likely that someone else would bid higher, plus we weren’t comfortable with some of the contingencies, so we’re dropping out. Â A lot of stress and hurry for nothing! but, there will be other houses, and we’ll find something eventually. Finally, because every blog post should have a pretty picture, here is one of the ideas I’ve been percolating: a cluster of three leaves at the shoulder, with one leaf drifting down. Â The colored swirls indicate where I’m thinking of using some embroidery to suggest movement. I’m not wedded to this design either, but I like it better than the others so far. Of course, in the end, I may just throw up my hands completely and send in the garment without any further embellishment. Â I don’t think that would be a tragedy, either. I like this last one a lot. It seems to sort of “lift” the garment. Maybe because the bottom of the jacket is dark and the bit of dark at the top ties it together.. I like this better than separate leaves. It’s almost a corsage on your shoulder. Perhaps the bottom leaf is a little too dark? It seems to stand out from the rest. I like this one best. Love the embroidery swirl, too. I think it stops the top curve from being too ‘blocky’ and unites the dark and lighter sides of the kacket, with the swirls giving the impression of movement in the falling leaves. I like this a lot! The only thing that gives me pause is the mirrored swirl in the middle (too matchy-matchy?). As I’ve followed along with your process, I keep remembering one possibility you put up that I liked a lot, so I just went back to find it. It’s on January 16, the one with the “beads” swirling down the front. Clearly, it’s not just right, but the over-all effect seems to me to carry out the “feel” of the garment without being literal with respect to the leaves and leaf colors. How would it look if the curving lines didn’t go so far down, and not so far over toward the shoulder, and the bead colors shifted going down from top to bottom, light to dark? Of course, I’m aware that time is running out if you’re to hit that deadline in eighteen days, but your track record at getting things done in astonishingly short order might make it possible.